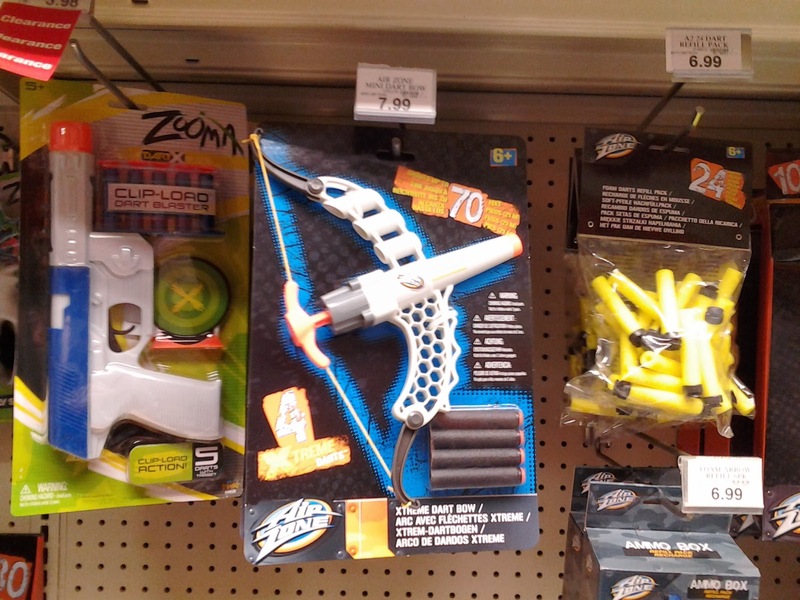 I stopped at TRU on the way home from class today, and happened across several new items in the dart blaster aisle. For example, $30 gets you a Dual Double and Xcess Twin Pack! All decent pistols, and a good price for the lot. Forget about the foam rings. Use those for turret seals modding other blasters. 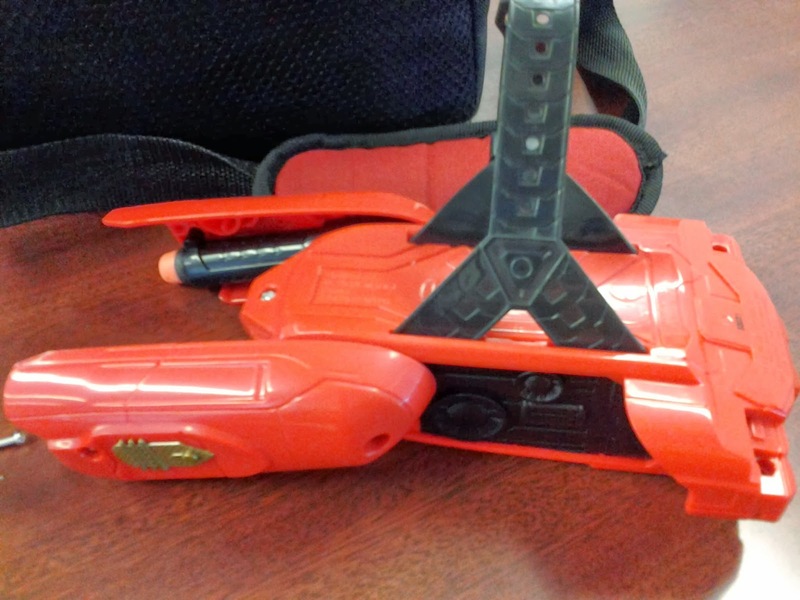 Next is the newest Jolt-type blaster, manufactured by Prime Time Toys. The Xtreme Dart Bow claims 70 ft. ranges, and I grabbed one with a gift card for $8... for science. 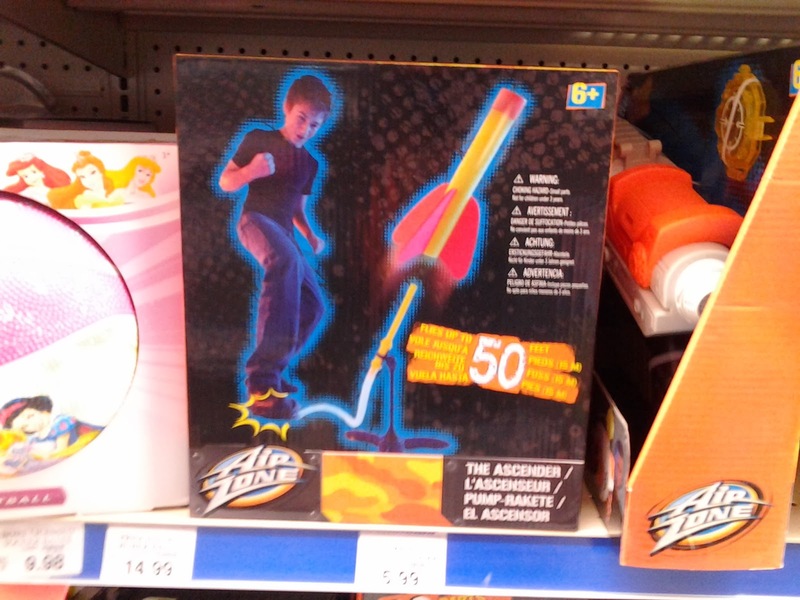 Complete with XTREME DARTS, no less! 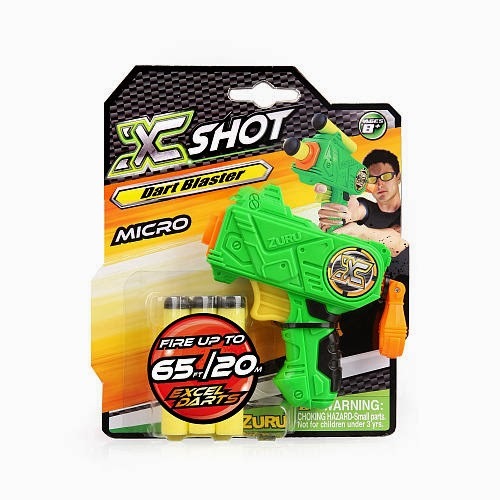 Zuru has their smallest blaster, the Micro X Shot, listed online. $4, but it claims the standard 65 ft. ranges that many Zuru products boast. If I see one in store, I may grab it for testing. Hey, Kay, nah nah. Come on, man, you get a Series Four De-atomizer and I get a little midget cricket? 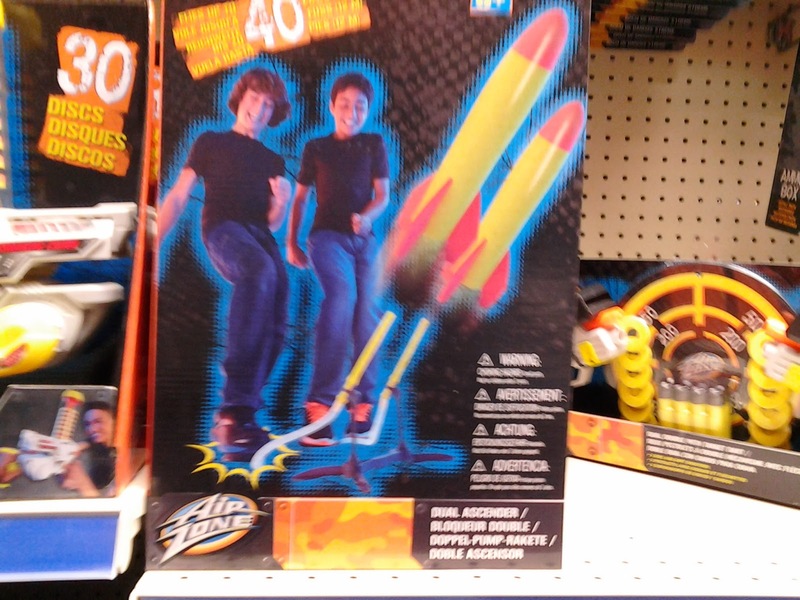 There were a few Air Zone stomp rockets, nothing that would normally be used for Nerf. But I'll mention them anyway; some people have little kids that could have fun with these toys. Obviously a bonding moment for dudes everywhere. 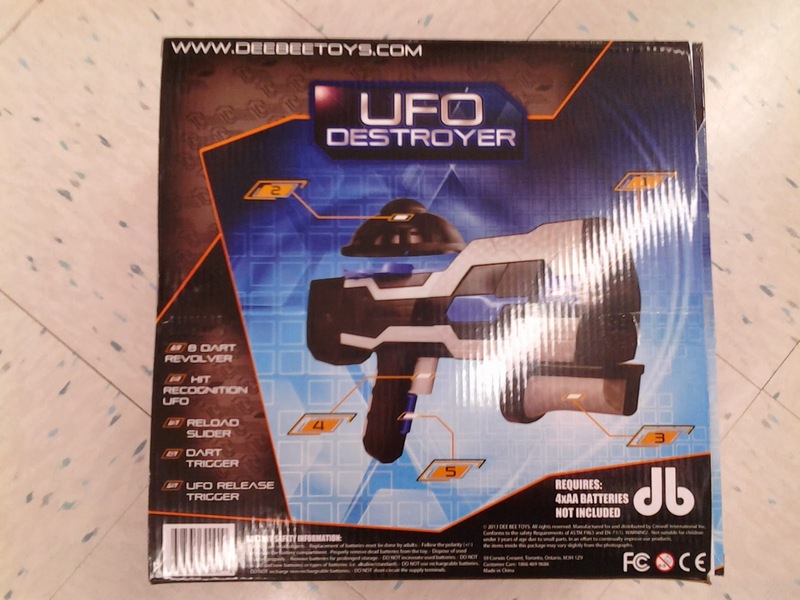 Finally, the newest in DeeBee's UFO Blaster line, the UFO Destroyer. 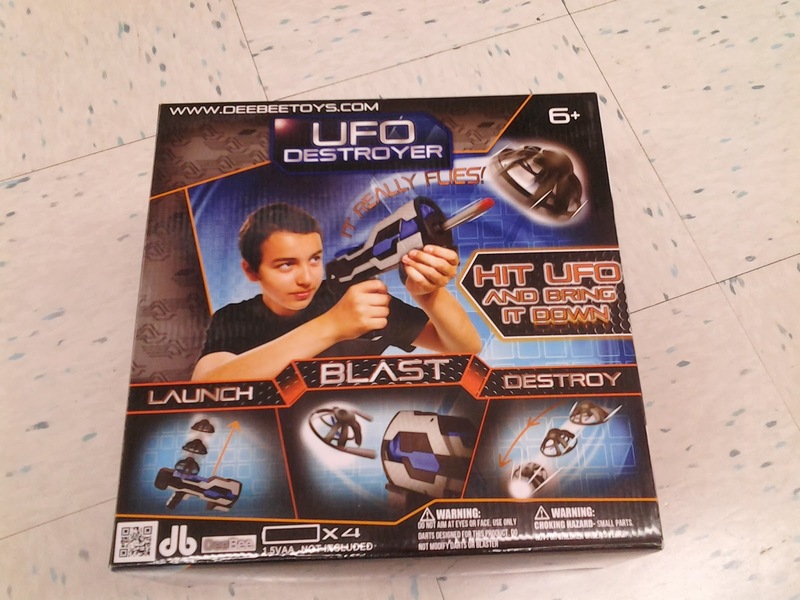 This time, it appears we have an 8-shot, manual prime blaster, and the batteries are simply for spinning up the UFO's tiny propeller. It's certainly a different look than the last series, but it was $25 at TRU. Note that the web address on the box redirects you to the home page for their EYESPY line of toys. So we'll have to watch in stores for any other similar products for the moment. As far as I can tell, this legislation would have no effect on Nerf, as the toys are already either in bright colors or transparent. But it's still worth noting considering the area of concern. "Law enforcement officers have extreme difficulty — extreme difficulty — in distinguishing between the real thing and what is fake ... especially when officers must make a split-second decision in a very dangerous situation," de Leon said. He added later, "This is about saving lives." More than 200 such shootings occur each year across the country, he said, citing a 1990 U.S. Department of Justice study. Several Republicans objected that the bill could endanger police officers because some real guns are now manufactured in different colors to appeal to consumers including children. Smith & Wesson, for instance, makes several handguns with pink hand grips to appeal to women. Nerf N-Strike Elite NERF Cam ECS-12 Blaster! 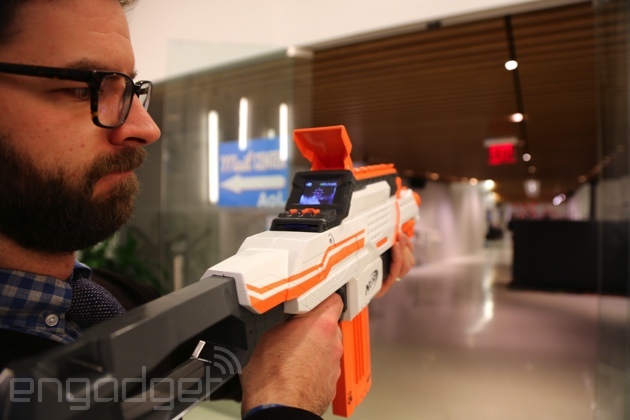 Thanks to the guys at Engadget, we have word on Hasbro's big blaster of the year - one with a built-in camera. It's another flywheel blaster (seemingly this generation's overused propulsion system), and the camera is only a 0.3 megapixel device (so video quality will be fair to bad, in all likelihood), but can record for 3 hours on a set of batteries. The screen in the back shows what's being recorded, and even has a reticle for aiming. Right now, the price point being tossed around is $75 - REALLY EXPENSIVE. Personally, I'd rather have a stiff, secure N-strike rail attachment that could be mounted on top of any blaster. This is still a prototype, though. Hasbro, could you possibly leave the screen as-is, and just upgrade the camera a few megapixels? The screen is fine just for showing what's recording, so a tiny, low-res screen is fine. We just want video that looks decent once you pull out the SD Card and upload to Youtube. A Response to Blaster Labs' Opinion on "What Hath Hasbro Wrought?" The folks over at Blaster Labs wrote an interesting article concerning my earlier essay/complaint, "What Hath Hasbro Wrought?" and offered some good thoughts on the matter. Naturally, I have to respond in kind. YOUR MOTHER WAS A HAMSTER, AND YOUR FATHER SMELT OF ELDERBERRIES! More seriously, I'd like to contribute thoughts on the matter. More after the jump. Our dearest Hasbro, what of thy design? when new things are of the fallacious sort? 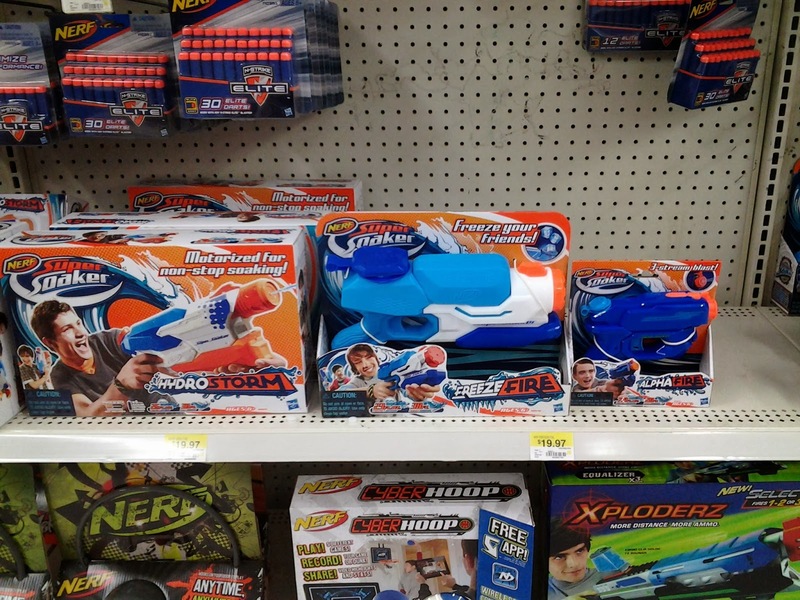 Yes, the one on the right is a glorified squirt pistol. And Nerfers everywhere let out a cry. This Thunderbow, a freakish spawn of hell! a squirt gun they somehow believe we'll take! From CPS to manual everything! Or innovative blasters far and wide! And wish for better toys from days of yore. it's cheap, and each old blaster is a gift. is "Hasbro, make REAL toys with which we'll play!" New Megas! NOM NOM NOM! 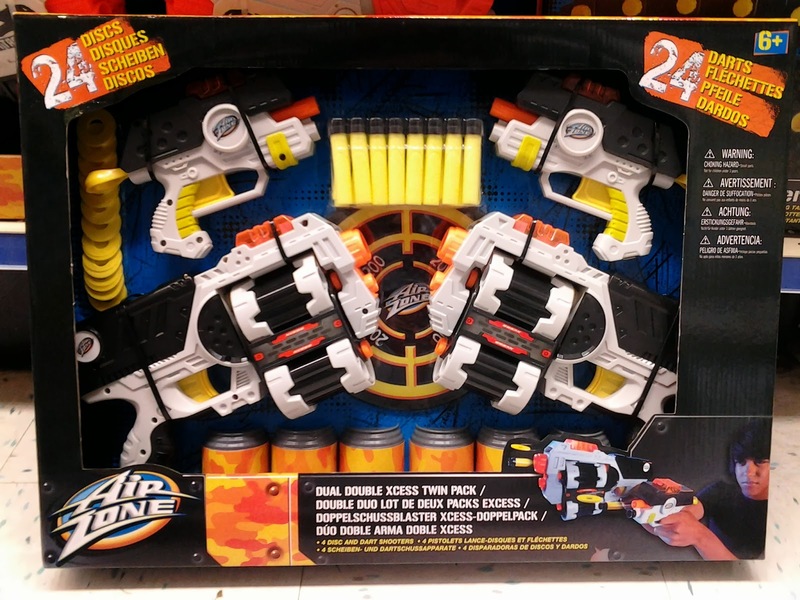 The Nerf Zombie Strike product line has been expanding recently with things like the Fusefire, Sidestrike, and the Ricochet. The former two blasters rely on established propulsion mechanisms (torsion arm and elite plunger tube, respectively). The latter, however, is minimalist in design and clearly not powered by the usual Vortex subjects (torsion arm or flywheels). It's also the cheapest blaster in the line to date at just $8. I went ahead and bought one for dissection and testing. It's interesting, but ultimately not a very effective blaster. More after the jump! Iron Man Flip & Fire Gauntlet Review - A Pleasant Surprise! 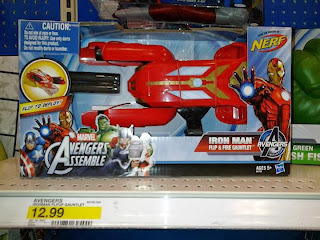 When I grabbed the Iron Man Flip & Fire Gauntlet at Target yesterday, I didn't have high expectations. The Hawkeye Bow turned out to be a glorified Jolt, and the Captain America Shield didn't fire darts very well due to its poor internals. Imagine my surprise, then, that the cheapest of this year's Avengers-themed blasters turned out to be the best one. The gauntlet is simple in operation - folding the barrel arms back into the main body primes the blaster. When you decide to fire, flip the barrels back out and press the trigger button. Plastic straps not unlike those in ball caps secure the blaster to your wrist (their adjustment range is decent for a children's toy). Now for the disassembly! First things first, Josh over at Bay Area Nerf found the much-speculated Hawkeye Longshot Bow at Toys R Us for $15. 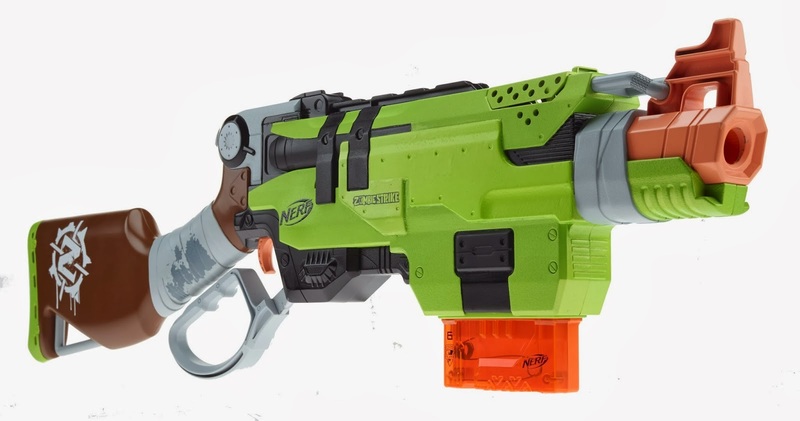 While it's an aesthetically pleasing blaster, it's essentially another Jolt, but with enough plastic and branding to triple the price of a Jolt. Unless you REALLY want it, or have a great idea for improving it, I'd personally avoid it. I, meanwhile, found the Iron Man Flip & Fire Gauntlet at Target for $13. It's another gimmick of a blaster - with the exception of the priming method (fold the blaster closed to prime, then unfold and press the button on top to fire), it appears to be a miniature Strongarm. The original one, mind you, not the N-Strike Elite revolver. I grabbed it for science, but I have low expectations. Sadly, unless the modding community makes something of these blasters, they're not worth buying. Hasbro, why do you have to make such crappy blasters when it comes to movie-themed toys??? 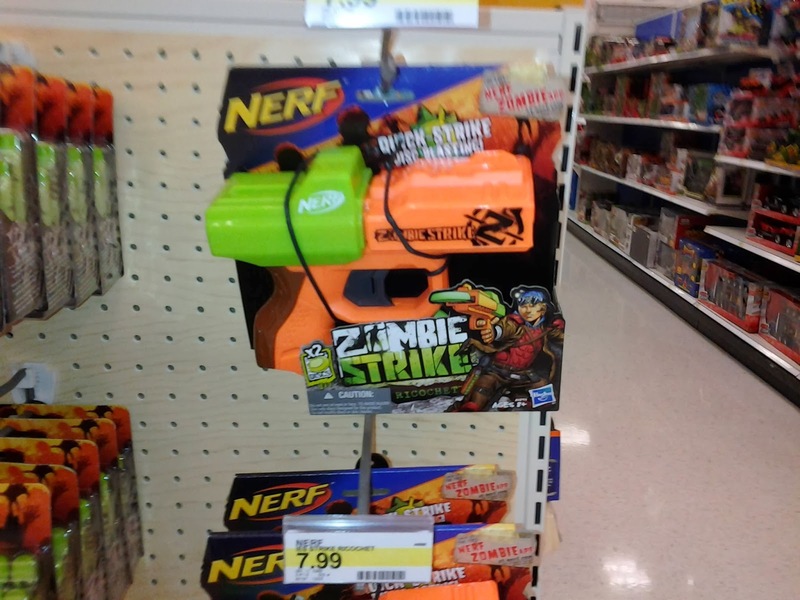 Coming this Fall: Nerf Zombie Strike Slingfire! Apologies for the month-long delay in posting. Finals and other things popped up. But I thought I'd post some cool news from Hasbro (and a special thanks to Foam From Above for the scoop given to the NIC). 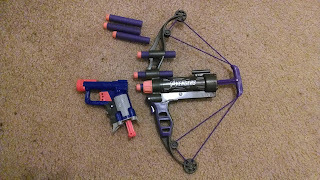 It's exactly what it looks like: a lever action blaster that uses N-strike clips and gets 75 ft. ranges (as advertised by Hasbro). So for all you fans of the Buzz Bee Rapid Fire Rifle's design (but not of its shells and low ranges), this looks like the answer to your prayers!